Fran Tarkenton was selected in the third round of the NFL draft in 1961 by the Vikings (1961-1966, 1972-1978). He was an instant star quarterback with 4 TD passes after coming off the bench to beat the Bears 37- 13 in the 1st game in franchise history vs. Chicago (9/17/61). He was dealt to New York in 1967 and back to the Vikings in 1972 in stunning trades. He was named the MVP of the NFL is 1975. Tarkenton led the Vikings to 3 Super Bowls (VIII, IX, XI).  During his career he played in 9 Pro Bowls and was named All-NFL 4 times. At retirement, he led NFL lifetime passers in attempts (6,467), completions (3,686), passing yards (47,003) and TD passes (342). He was inducted into the Pro Football Hall of Fame in 1986 and the Vikings Ring of Honor on 1998.